Ixwebhosting.com has in the past responded to past posts, and I hope they will do so again. Because one of their affiliates is trashing their company. Clearly it makes no sense for Ixwebhosting.com to pay someone that is telling people to avoid Ixwebhosting.com. A few months ago I encountered Digitalfaq.com, a forum that is trying to be a review site. Despite claiming to be an expert on hosting, they provide nothing that will prove they have used the hosts they recommend or advice to avoid. There is no data that might help prove a host is good or bad. Personally if I was the owner of Ixwebhosting.com I would at least cancel their affiliate membership, if not seek collecting any payments that were made to digitalfaq.com. Their membership id is PID=3235990. Every place I look that ixwebhosting.com shows up on Digitalfaq.com I find the clickable link. Clicking the link for I find the following code in the URL for Ixwebhosting.com PID=3235990. 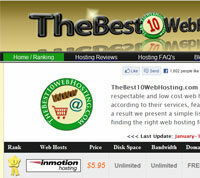 Not to mention some of the hosting companies that digitalfaq.com recommends do a lot of what ixwebhosting.com does. The following hosts depend on the amount of sales per month. So if you only bring in 1 customer you get the lowest amount, or should you bring in more 10 or more you may get the max per sale. But some of these hosts upon review find themselves on “review sites”. I search for a few that I knew are frequently on review sites with the term “*host name* reviews” and here is what I found. 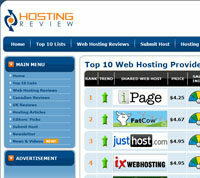 Arvixe.com, siteground.com, inmotionhosting.com, and Site5.com all magically appeared on webhostingstuff.com, a review site that charged host for being in the 1 – 25 spots. A small summation how webhostingstuff.com was not to be trusted. 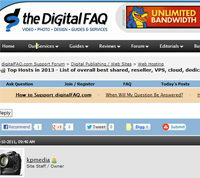 Any surprise that hosts that find themselves on other so called review sites are also on digitalfaq.com? One has to wonder if Digitalfaq.com feels they have not got enough payments from Ixwebhosting.com and changed their stance. Liquidweb.com $60 -$5000 or 5% reoccurring commission. Back when I first looked at the host Digitalfaq.com recommended I found that 89% of the hosts they recommend have very clear affiliate programs. 2 of the three had affiliate login areas. The one host that did not have a clear affiliate program had WHMCS which has a built in affiliate manager. 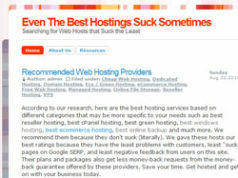 “You’ll see these sorts of hosts referred to as “oversellers” or “unlimited” hosts. This is because they’ll oversell their services, stuffing too many clients onto a single server, which causes everything to run slow. And because resources are finite — there’s no such thing as an “unlimited speed” CPU or an “unlimited size” chip of RAM — you’ll find that there are very narrow limits on what can be done with your hosting account. These limitations are buried in their site documentation, such as the Terms of Service. Unless you’re hosting a teeny tiny little HTML-only homemade site for personal use, then you’ll want to seek better quality services. These are NOT business-grade plans, as uptime tends to be unreliable, and there’s little room for expanding your site (including more traffic as your business becomes more popular). For that matter, it can be unacceptable for a high-traffic personal site. But Digitalfaq.com changed their stance on Unlimited hosts back in March. Why Digitalfaq.com change their mind on recommending unlimited should be clear. After all how much did those two hosting companies pay out? Most review sites don’t link back to host they don’t recommend. Especially when they make it a point to capitalize on trashing a host while recommending another. I meant to do this sooner, but as I have stated many times before this site does not pay the bills. That and I have a new house being built, the time table was recently moved up from being finished in late October to late July. Just in case Digitalfaq.com thinks I lost interest. I plan on doing one of these posts for every host that digitalfaq.com chooses to trash like ixwebhosting.com. 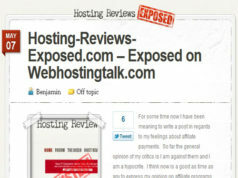 For those that ask by no means is this a defense of Ixwebhosting.com. I just feel that two wrongs do not equal a right. If digitalfaq.com’s actions did not influence a customer to choose Ixwebhosting.com, than they should not be paid for that referral. “Again, if you want an enterprise-grade quality host, look at EuroVPS. I am sure that would include some of the hosts they now recommend that offer unlimited hosting. Because the current list is between $25 – $500. So the very reasons that Digitalfaq.com uses to claim that Ixwebhosting.com is a bad host, makes them a bad review site. Just in case Digtalfaq.com decides to change or delete their post here is a screen shot. So in short Digitalfaq.com claims that they are a bad host based on their being with CJ.com and offering payouts near the same as the hosts they recommend. Ixwebhosting.com is also a bad host because they offer a unlimited hosting.com. So one has to ask, will Ixwebhosting.com take action on this rouge affiliate Digitalfaq.com? 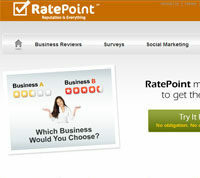 Next articleWeb.com, 3 Million customers and only one site to show for it. Is hostingsthatsuck.com Following the FTC compliance for Fatcow.com?